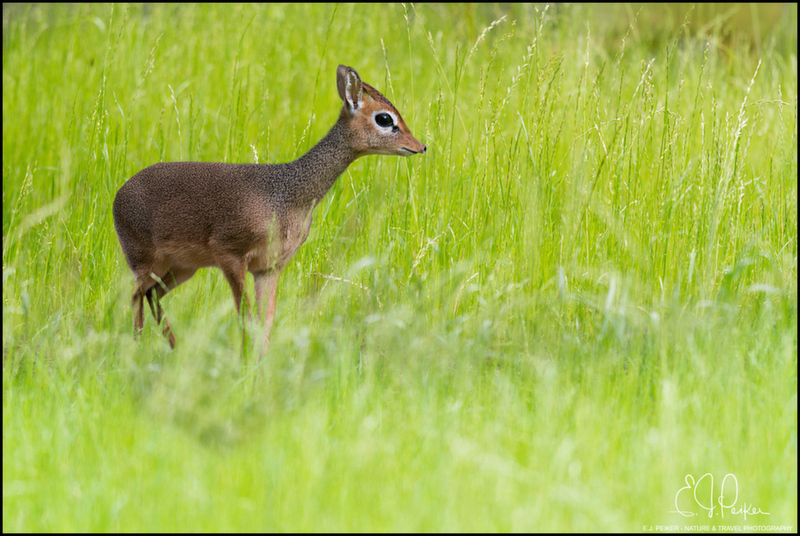 Africa's smallest Antelope, the tiny Kirk's Dik-dik. These teeny guys are so cool. I’m surprised he stands above the grass. Their nose is unique and the huge eyes are fascinating.. Such beautiful little creatures that mate for life, usually where there's one, their mate is close by. Lovely image! Great shot of this little guy E.J. good catching it out in the open EJ. Nice job capturing him in the clear; you put the time in you get the results! What a cute and somewhat magical little creature. It's been hard for me to get a Dik-dik photo out in the open all these years . Love the lush greens around the cute creature.